Triduum is the collective term for three days from the evening of Holy Thursday to the evening of Easter Sunday. The Triduum begins with evening mass on Holy Thursday and ends with Easter mass. 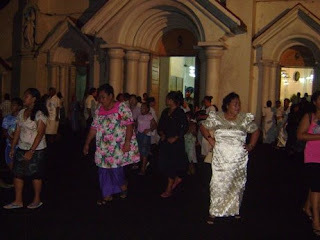 Samoa is an intensely religious country, and everything shut down for Good Friday. Shops were closed, buses didn’t run. Then everything was business as usual on Saturday, and now everything’s shuttered again for Easter Sunday. In The States, Holy Thursday is usually a pastiche of faces from different masses all forced into one evening mass for the entire community. 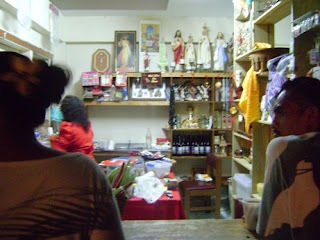 But since a lot of people don’t show up for Holy Thursday mass, everyone still seems to fit in the church. Not so here. There’s only one English mass on Sunday, and there’s only one English mass on Holy Thursday, and the weird thing was that EVERYONE was there. The church was packed as usual. It’s always interesting to see how the washing of the feet is going to work. At St. Anne’s, they used to wash hands. 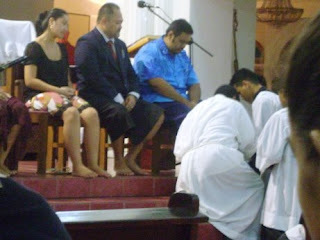 At St. Gabriel’s, everyone got their feet washed. And I’ve seen where specific people are pre-chosen to have their feet washed (This is the lamest, I think.). Here, the altar boys brought out 12 chairs, and the priest said, and I’m paraphrasing here, “First 12 congregants up here get their feet washed.” It actually worked pretty well. I did not go up. As I said above, the whole country shuts down for Good Friday, and the service at the cathedral took things no less seriously. I guess it’s been a long time since I’ve been to a Good Friday service, but I was a little weirded out by the priest lying prostrate. And then they did the rosary for the Divine Mercy. And I could feel Vatican 2 getting all squeamish. The priest apologized that our church doesn’t have a relic from the actual cross that Jesus died on. Apology accepted. Then people went up and kissed the cross. The collection basket was underneath the cross, which I found tacky. I just touched the cross. Kissing seemed a little too intimate. The priest nodded at me in approval. They switched presiders on us for Easter Vigil, which felt wrong; like having a waiter take your order, bring appetizers and entrees, and then having a new guy come in to handle dessert. But more obnoxious was the candle situation. As the crowd assembled outside the back of the church, everyone bought candles from the small church store. I have no problem with purchasing my own candle… But then as soon as things get started, New Presider says, “We’re not going to be doing candles tonight because the wax gets all over the church.” Granted the candle was only $1 WST, I was still annoyed that no one put the kibosh on the candle sales. Whatev. We had no baptisms, which was bittersweet. On one hand, it sped up the evening, and we were out of there much faster; on the other hand, they had a pretty crazy baptismal font setup complete with wading pool, fountain, and milk cartons. 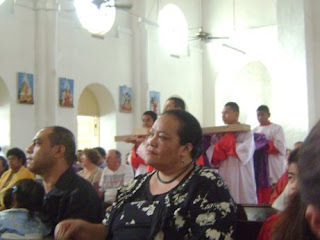 But no newbies at the English mass; the Samoan masses had all the fun. Overall, it was interesting to experience the Triduum in a new place, and Easter Vigil is always kinda neat when you get through the readings in the dark, and then they turn on the lights and the whole symbology is impressive. And who doesn’t enjoy a good Passion Play? But I think next year I might try the village. I hope you’re enjoying your Easter. Pictures below. 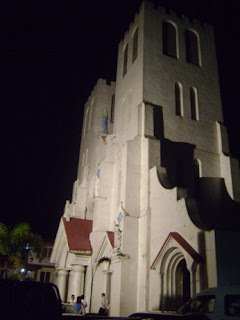 The cathedral with dramatic lighting. 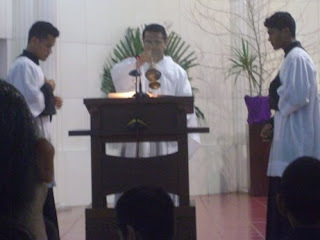 Samoan mass ending on Holy Thursday with English mass set to begin moments later. Carrying in the cross on Good Friday. It's a little hard to tell from this picture, but everyone sitting around me now knows that I have no iron. The shop that sold the stupid candles. 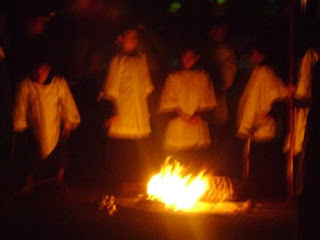 Alter boys next to the fire. I enjoyed your observations/reflections on the Triduum. Thanks for calling yesterday. It was really fun for all of us to get the chance to chat with you! Not quite the same as having you here though. We miss you! Oh, the lack of iron, the prevalence of wrinkles! Painful! But given the circumstances, it's quite forgivable! 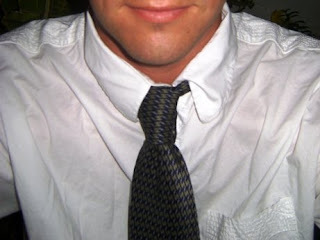 Ironing solving: Fold your shirt neatly then put it under your mattress or mat that you sleep on. Another trick I learned from my mother when we ran out of coconut shells in Savaii.